Early to Mid-1970's - I was in high school in 1973 when the OPEC oil embargo started (for younger reader's reference - 1973 is just about when disco music became popular). I remember my parents turning down the thermostat (along with the radio) and waiting in line for hours to buy gasoline....... It wasn't all bad news though - it was an exciting time with lots of work being done in the area of energy conservation, alternative fuels, etc. New technologies were in rapid development and moved quickly into production. There was a major push towards fossil fuel alternatives like solar and and renewable fuel technologies. Many community colleges in the country were starting solar technology associate degree programs. Business, industry, education, government....... we were all engaged and focused on moving away from our dependence on foreign oil. Fast forward a bit to to 1977 - The oil embargo had ended in the spring of 1974, disco was peaking (remember Saturday Night Fever?) and alternative energy businesses and technologies were still hot. Some close friends built an amazing home with a huge thermal mass, solar hot water panels and even a small photovoltaic array. The house was positioned to take maximum advantage of the winter New England sun (at the sacrifice of curb appeal) and was not built with an oil, gas or electric heating system. The 1980's - Things had changed a bit since the late 1970's. Disco was dead, oil was relatively cheap and solar technology in particular, once so promising and exciting, had fallen off most of our radar screens..... As a result, many college solar technology degree programs were suspended due to lack of interest. The 1990's and early 2000's - Things like energy conservation and pollution were not part of mainstream discussion and oil (for the most part) was still cheap and available. Low gas mileage SUV's (I admit I still have and drive one) became the rage..... My solar house friends considered "trading up" to a larger, less energy efficient home but decided to stay put. Disco was still dead. 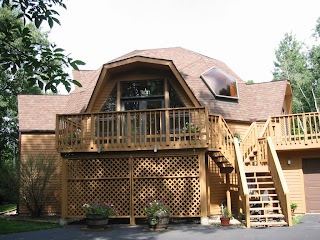 Bruce, a reader from Massachusetts, sent along a picture of his beautiful super energy-efficient geodesic dome home. I've added his message and picture below (picture is clickable for a larger view). Hello Gordon: Enjoyed reading your latest blog on "A Going Green and Disco Music". You mention how your friends built a house to maximize solar gain etc., it reminds me on how my wife and I build our house, inspired by Buckminster Fuller, a geodesic dome. Check it out. Since I'm 50 I can remember first hand what the oil embargo's were like. There's a lot of us "greenies" out there! Keep up the great writings!! Some of us do read them and enjoy reminising as well as riding the wave of the future which is here today!!! Steve W. - one of your students. Great post! As for disco...count me out...but my parents loved it. Too bad we didn't use the oil embargo as a lesson...we'd be so far a head right now.